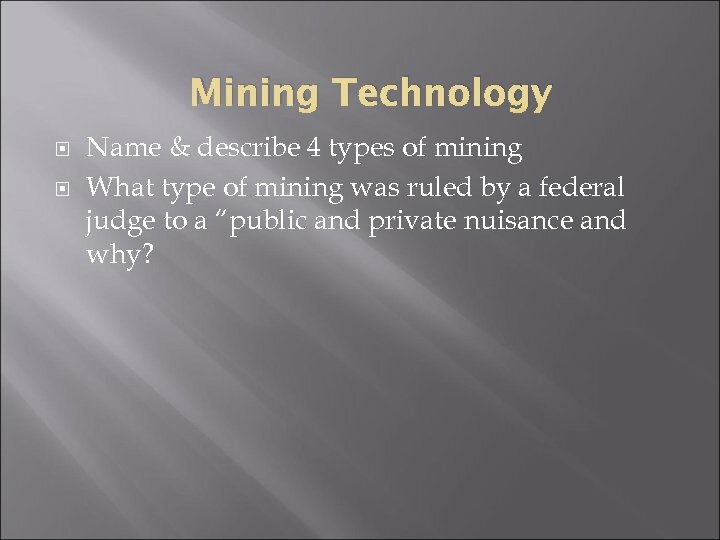 Mining Technology Name & describe 4 types of mining What type of mining was ruled by a federal judge to a “public and private nuisance and why? 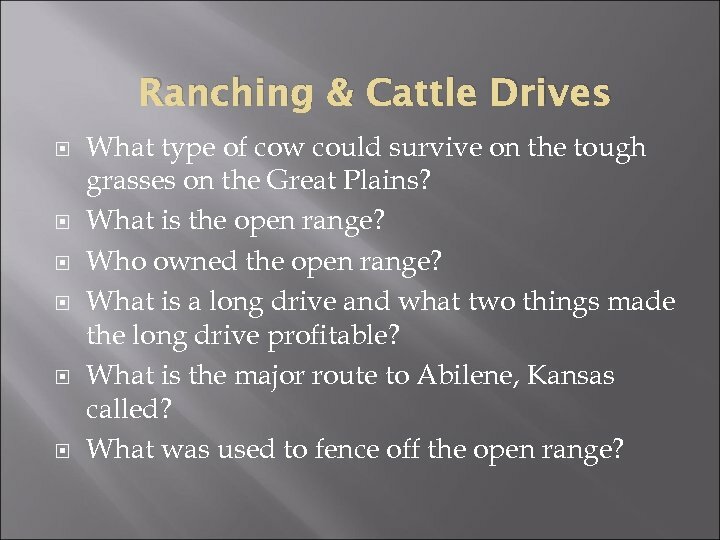 Ranching & Cattle Drives What type of cow could survive on the tough grasses on the Great Plains? 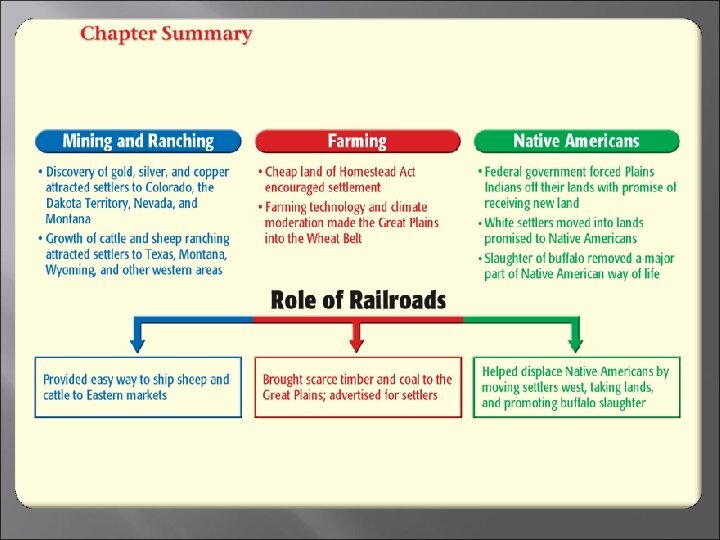 What is the open range? 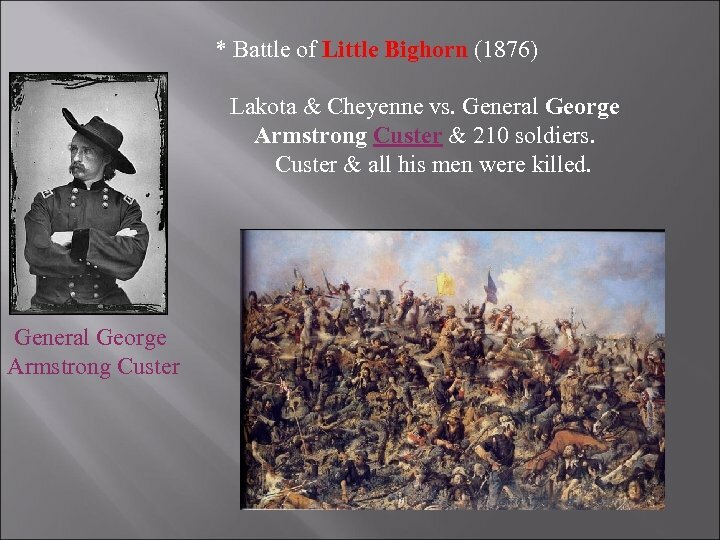 Who owned the open range? 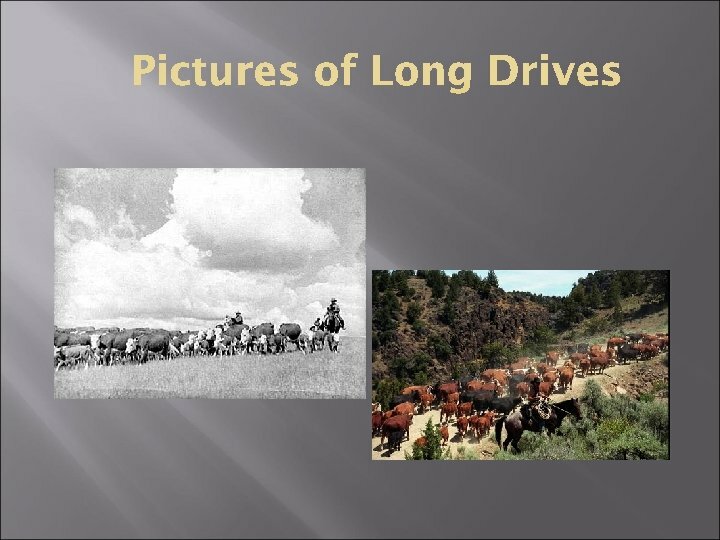 What is a long drive and what two things made the long drive profitable? 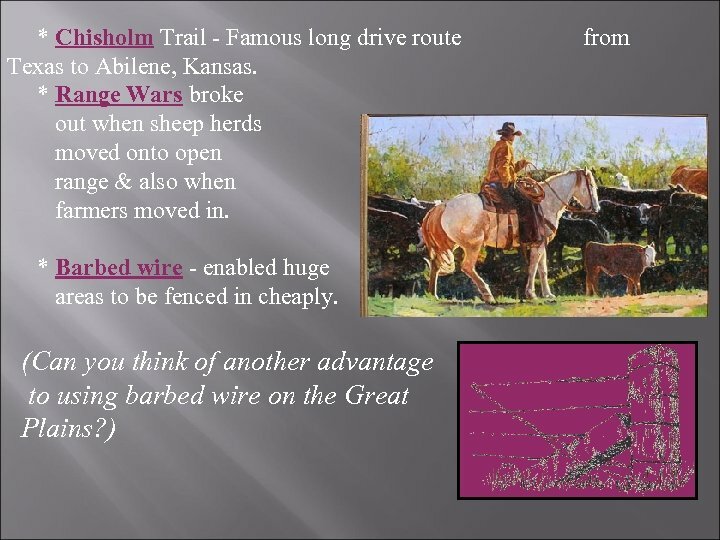 What is the major route to Abilene, Kansas called? 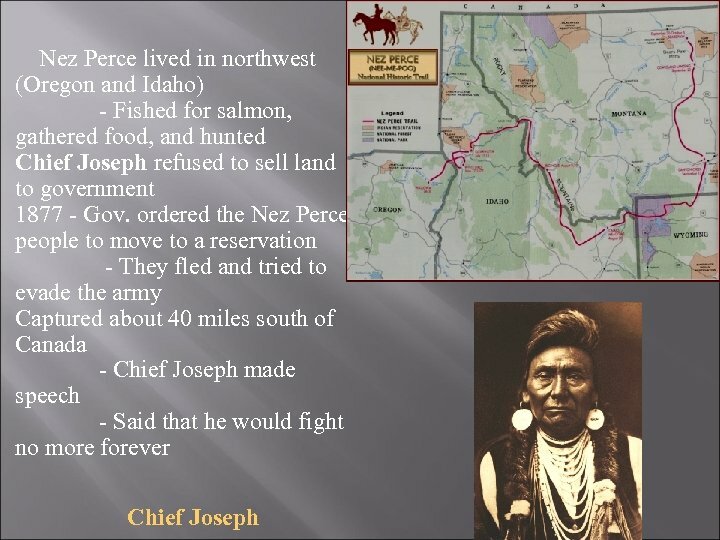 What was used to fence off the open range? 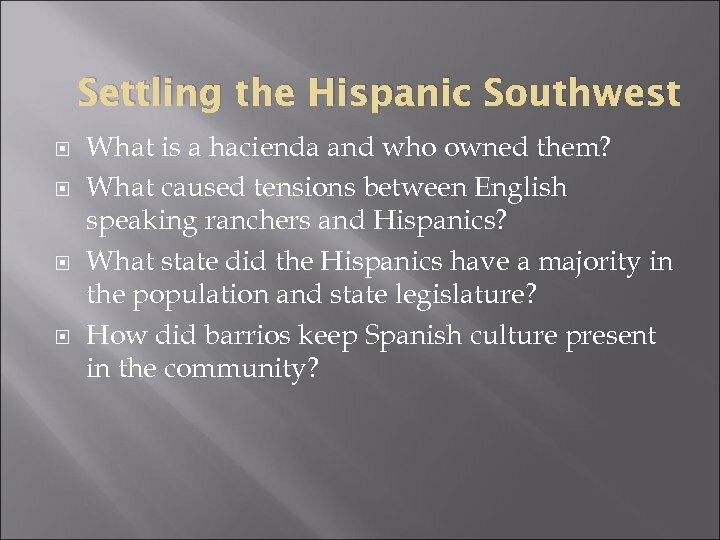 Settling the Hispanic Southwest What is a hacienda and who owned them? 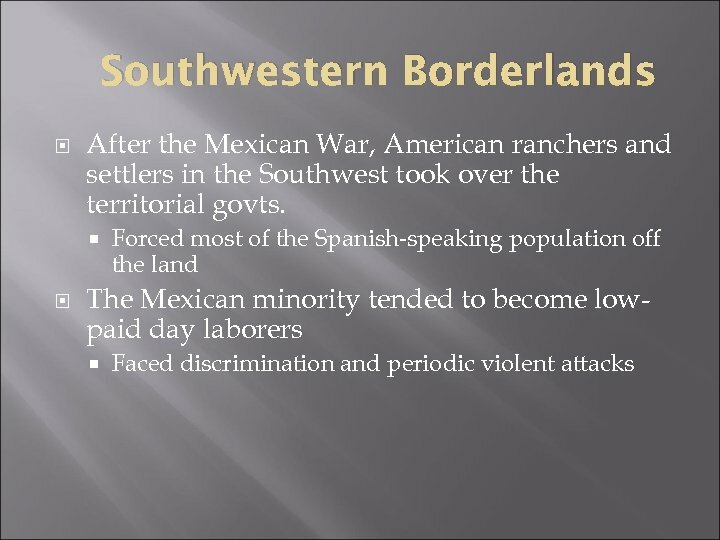 What caused tensions between English speaking ranchers and Hispanics? 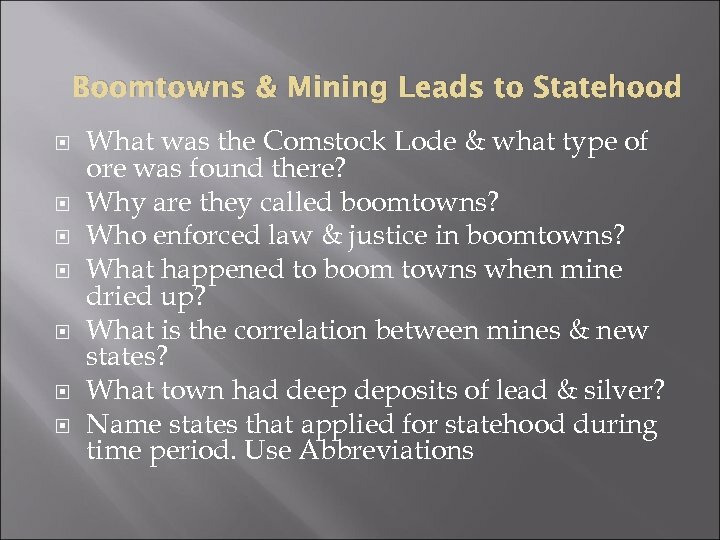 What state did the Hispanics have a majority in the population and state legislature? How did barrios keep Spanish culture present in the community? 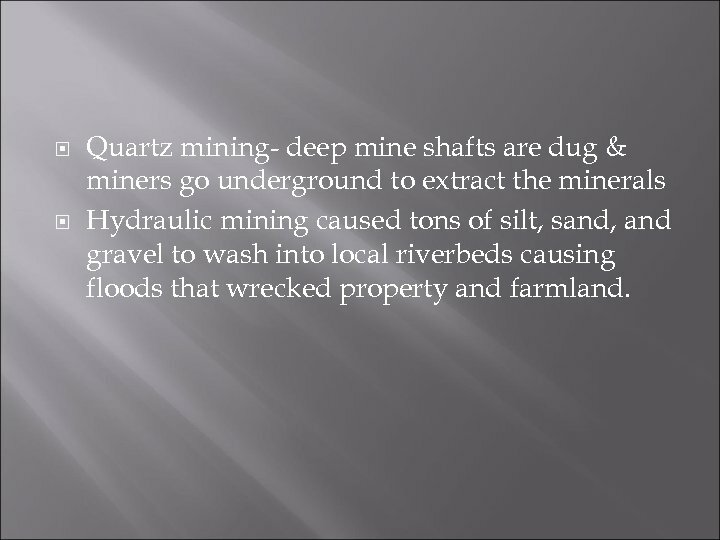 Quartz mining- deep mine shafts are dug & miners go underground to extract the minerals Hydraulic mining caused tons of silt, sand, and gravel to wash into local riverbeds causing floods that wrecked property and farmland. 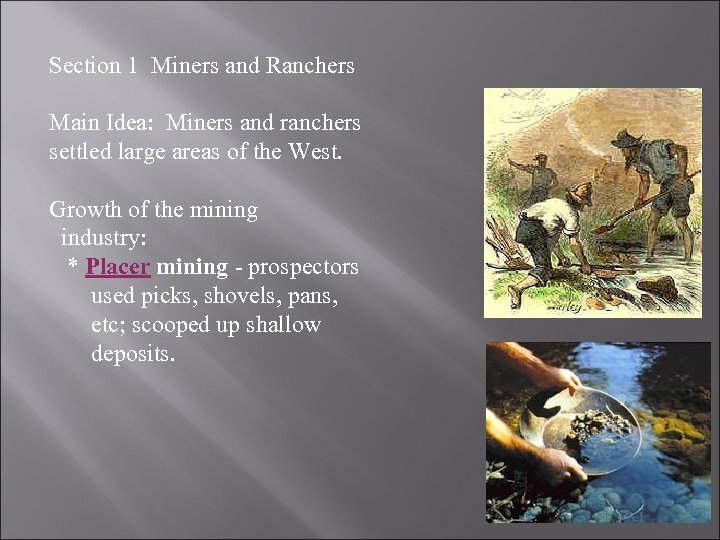 Section 1 Miners and Ranchers Main Idea: Miners and ranchers settled large areas of the West. 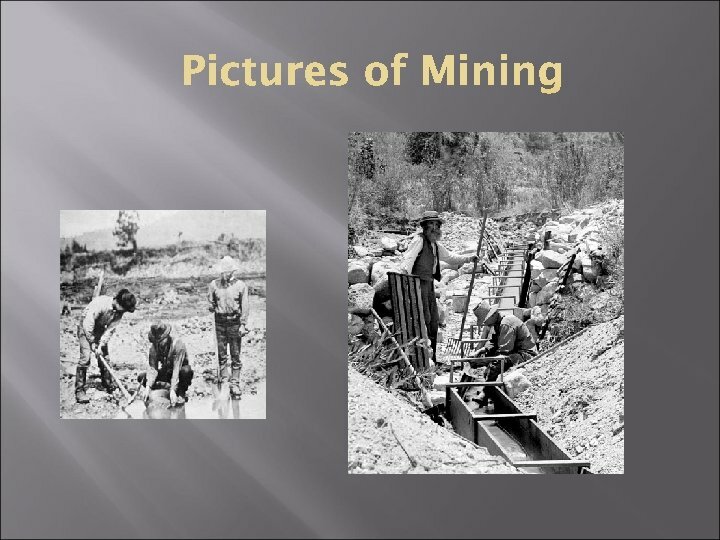 Growth of the mining industry: * Placer mining - prospectors used picks, shovels, pans, etc; scooped up shallow deposits. 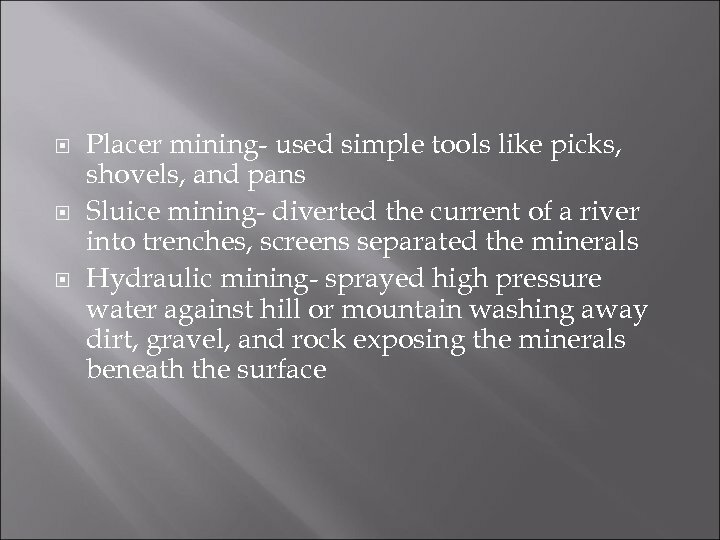 * Quartz mining - dug deep beneath surface. 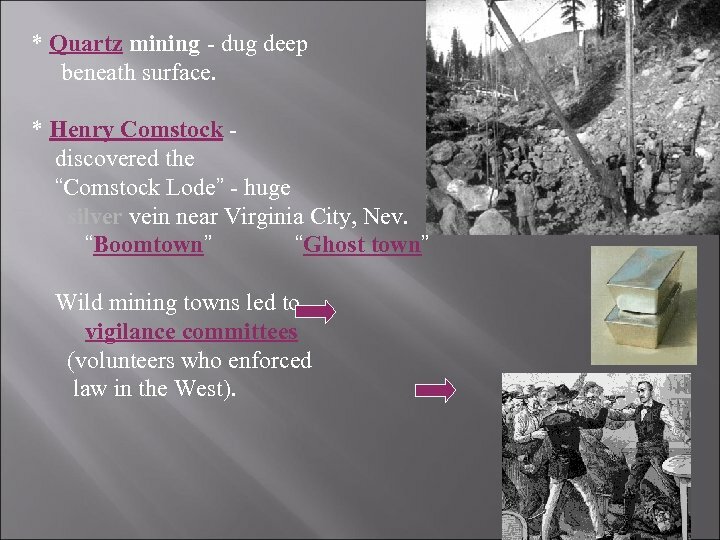 * Henry Comstock discovered the “Comstock Lode” - huge silver vein near Virginia City, Nev. “Boomtown” “Ghost town” Wild mining towns led to vigilance committees (volunteers who enforced law in the West). 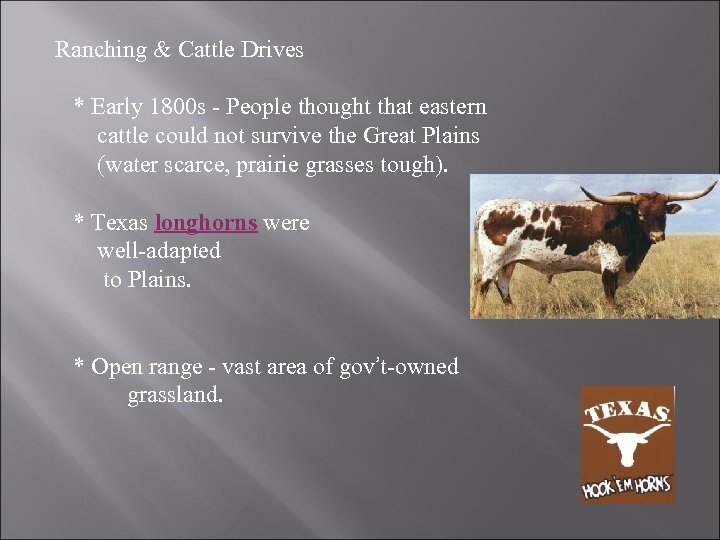 Ranching & Cattle Drives * Early 1800 s - People thought that eastern cattle could not survive the Great Plains (water scarce, prairie grasses tough). 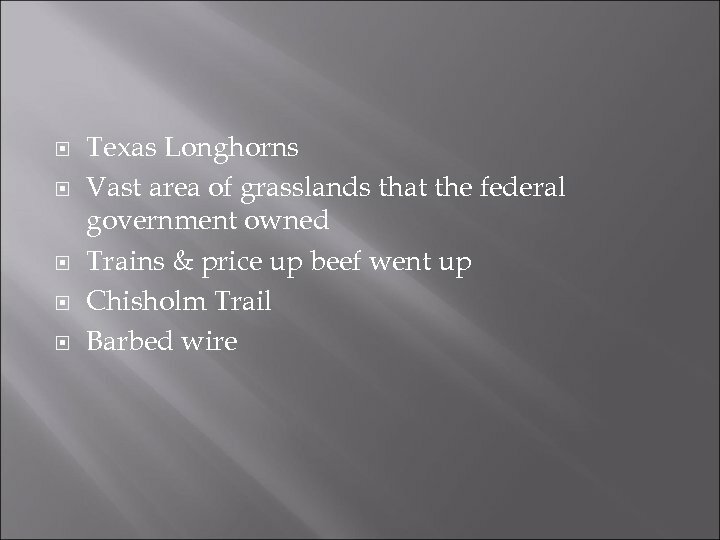 * Texas longhorns were well-adapted to Plains. 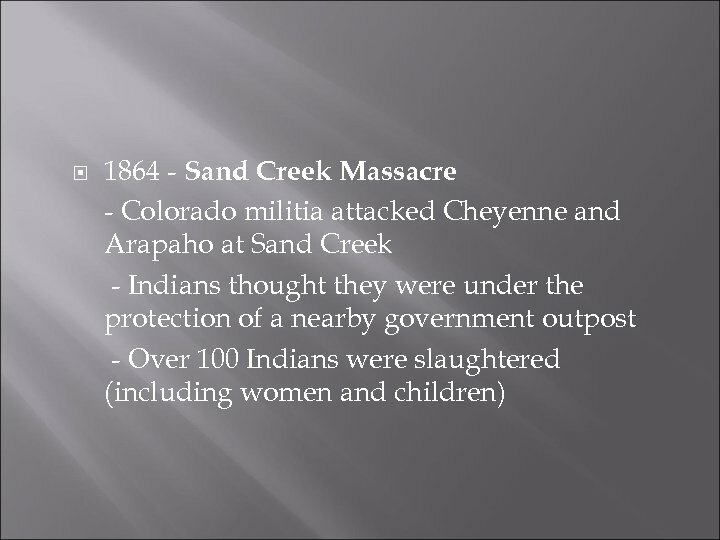 * Open range - vast area of gov’t-owned grassland. 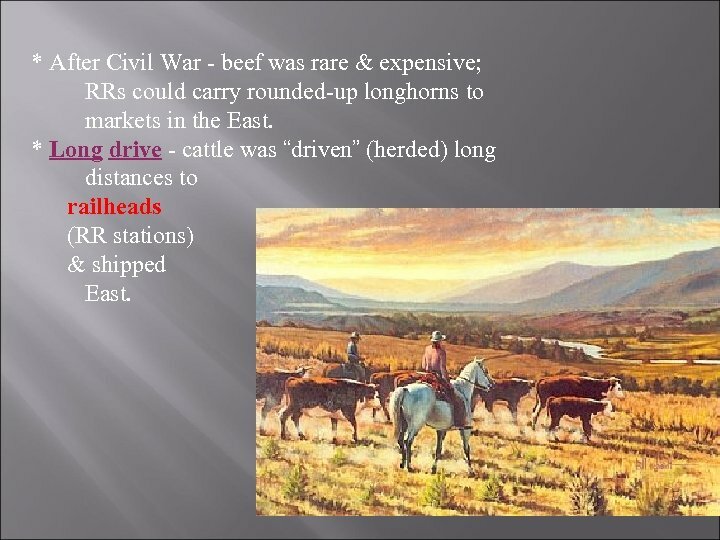 * After Civil War - beef was rare & expensive; RRs could carry rounded-up longhorns to markets in the East. 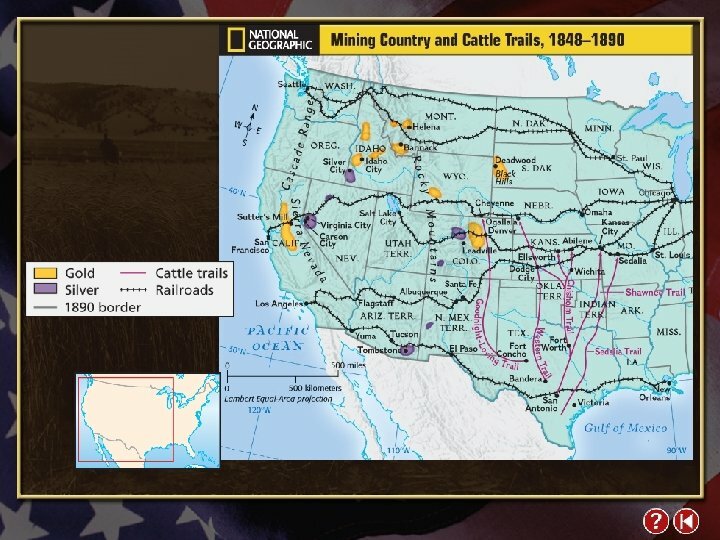 * Long drive - cattle was “driven” (herded) long distances to railheads (RR stations) & shipped East. Why did long drives end? 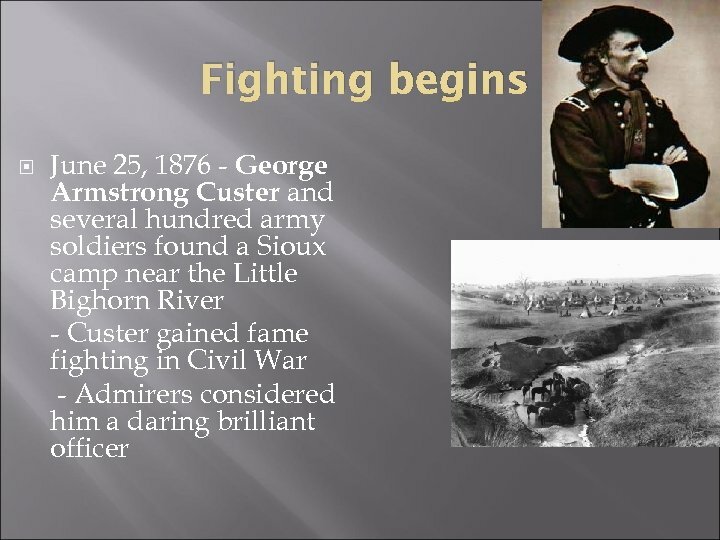 * Fencing-in of the open range. 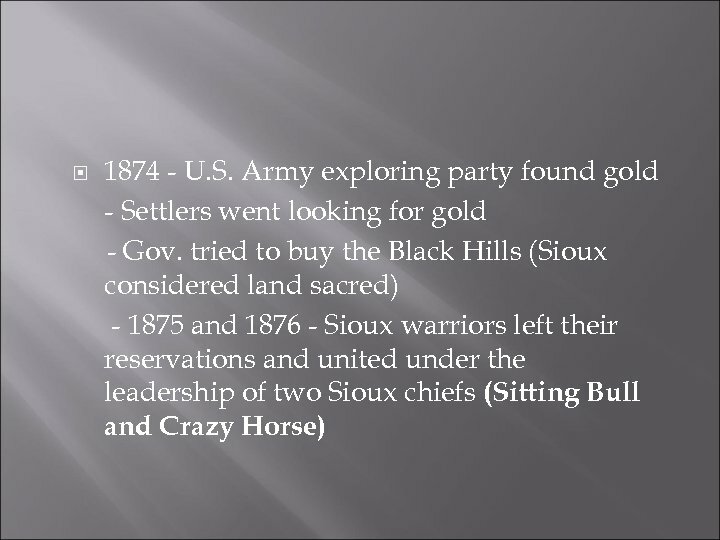 * Brits & European investors poured $$$ into cattle business oversupply prices fell ranchers went bankrupt! 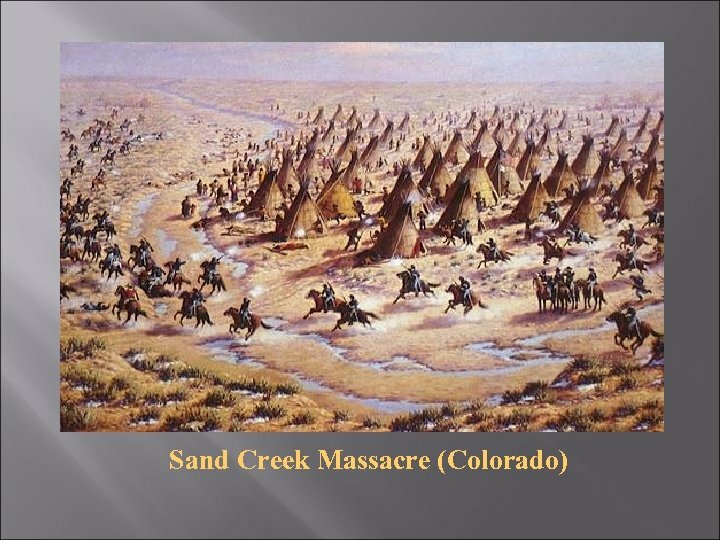 * Blizzards in 1886 -87; killed huge numbers of herds. 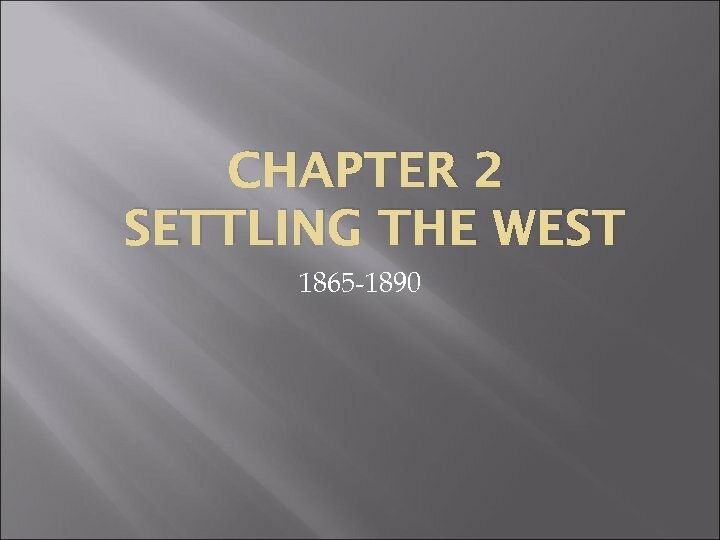 Result……. 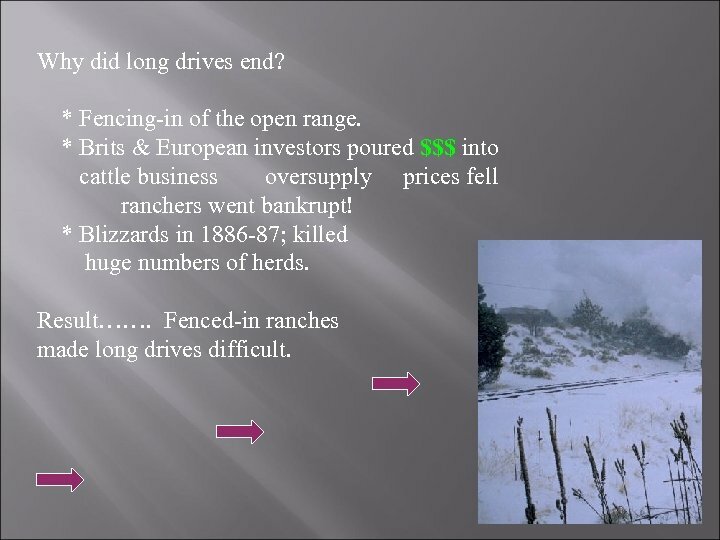 Fenced-in ranches made long drives difficult. 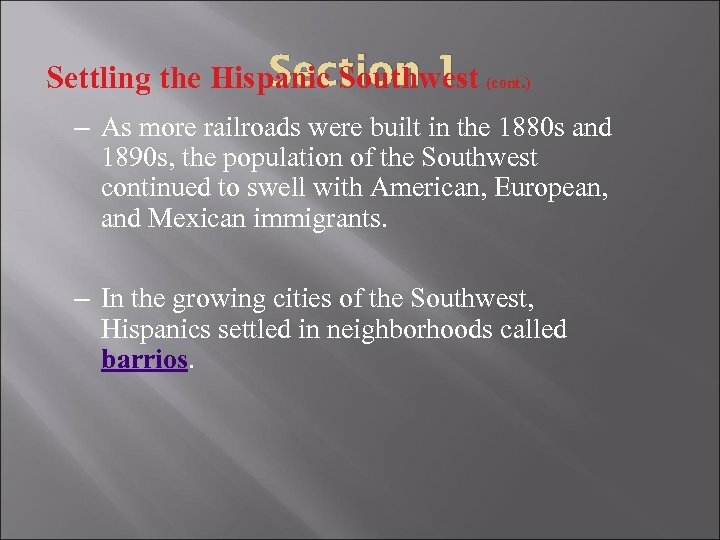 Section 1 Settling the Hispanic Southwest (cont. ) 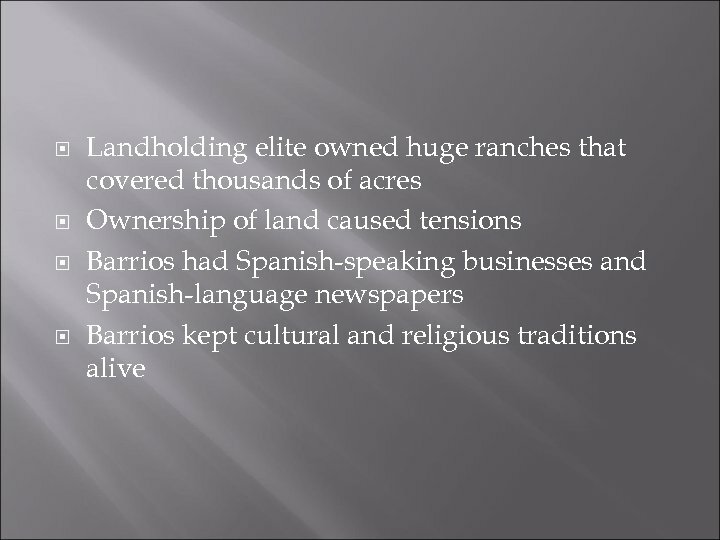 • In place of the mission system in California, landowners owned vast haciendas. 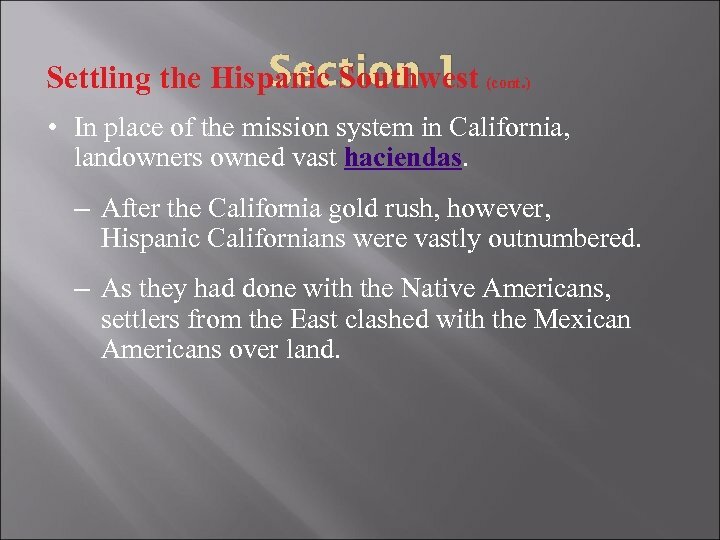 – After the California gold rush, however, Hispanic Californians were vastly outnumbered. 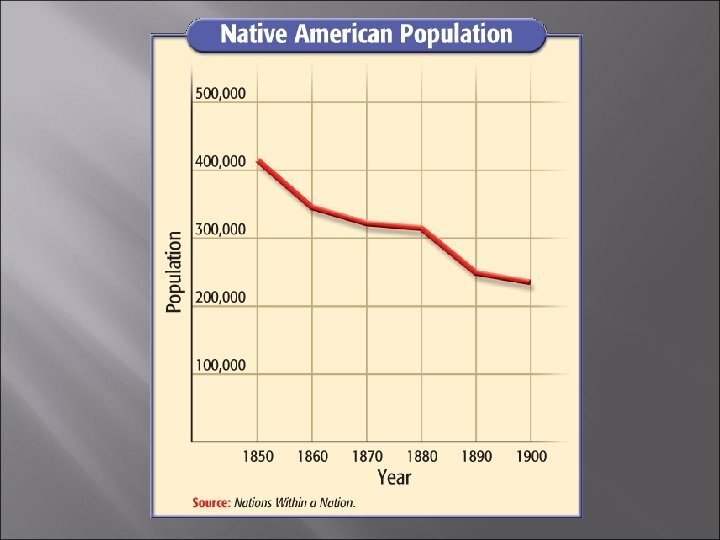 – As they had done with the Native Americans, settlers from the East clashed with the Mexican Americans over land. 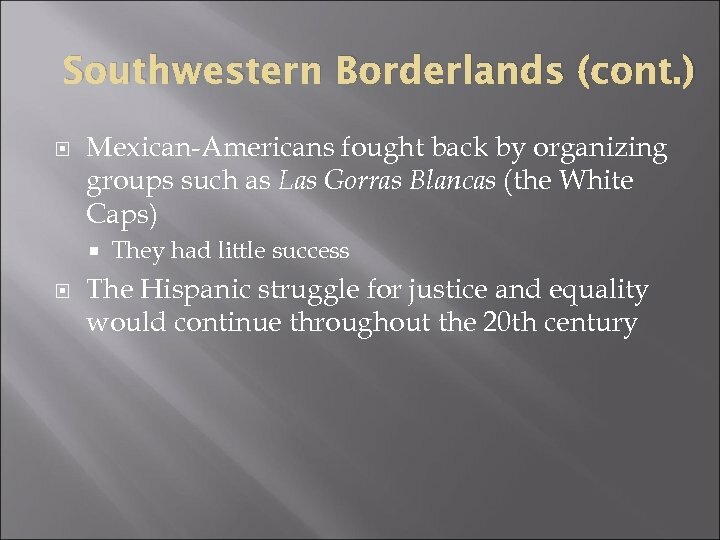 Section 1 Settling the Hispanic Southwest (cont. ) 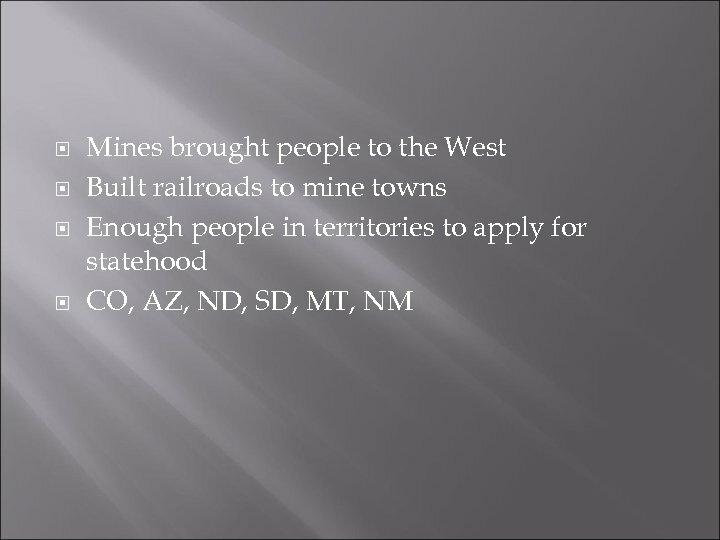 – As more railroads were built in the 1880 s and 1890 s, the population of the Southwest continued to swell with American, European, and Mexican immigrants. 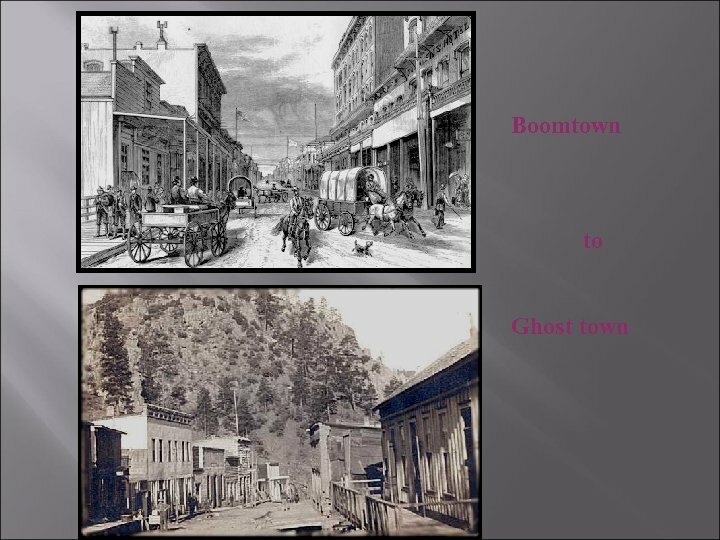 – In the growing cities of the Southwest, Hispanics settled in neighborhoods called barrios. 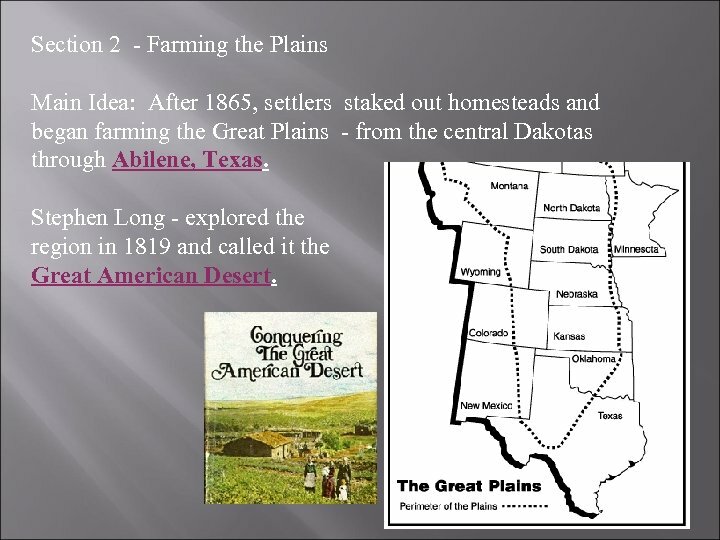 Section 2 - Farming the Plains Main Idea: After 1865, settlers staked out homesteads and began farming the Great Plains - from the central Dakotas through Abilene, Texas. 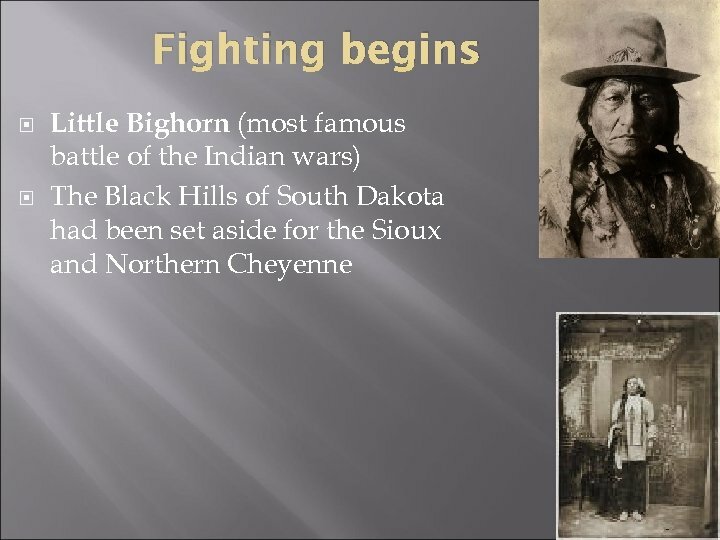 Stephen Long - explored the region in 1819 and called it the Great American Desert. 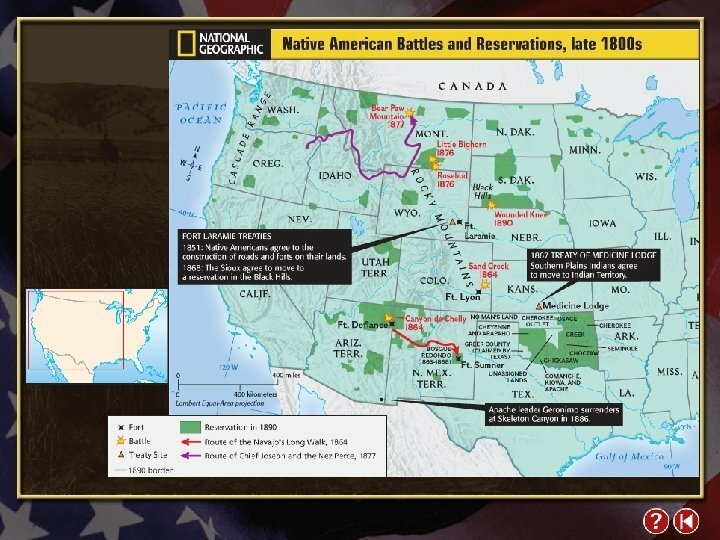 Why did settlement of the Great Plains begin? 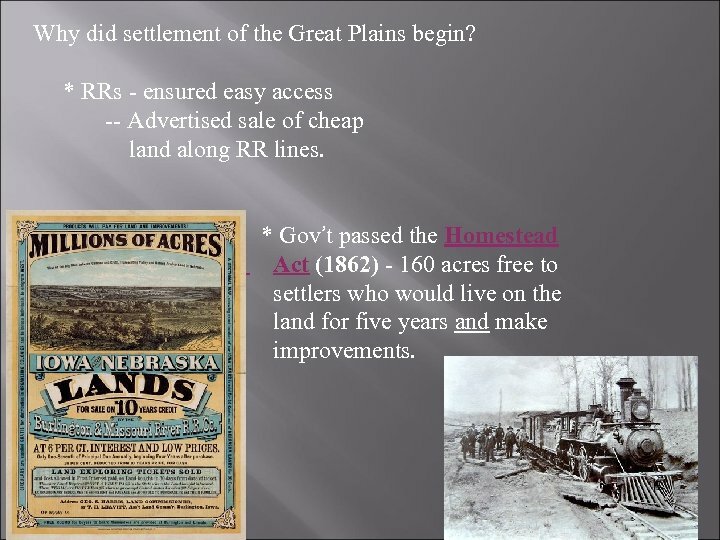 * RRs - ensured easy access -- Advertised sale of cheap land along RR lines. 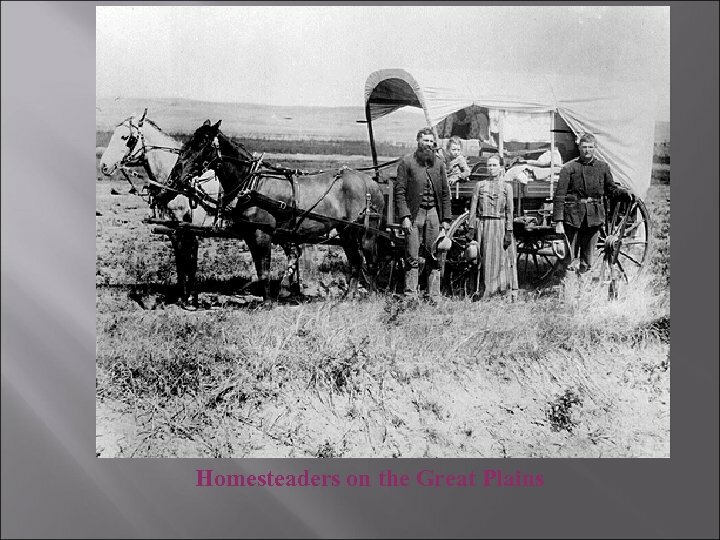 * Gov’t passed the Homestead Act (1862) - 160 acres free to settlers who would live on the land for five years and make improvements. 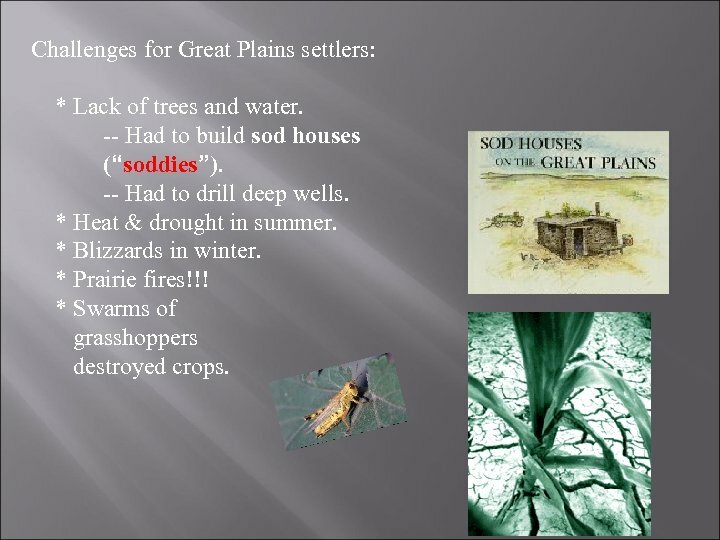 Challenges for Great Plains settlers: * Lack of trees and water. 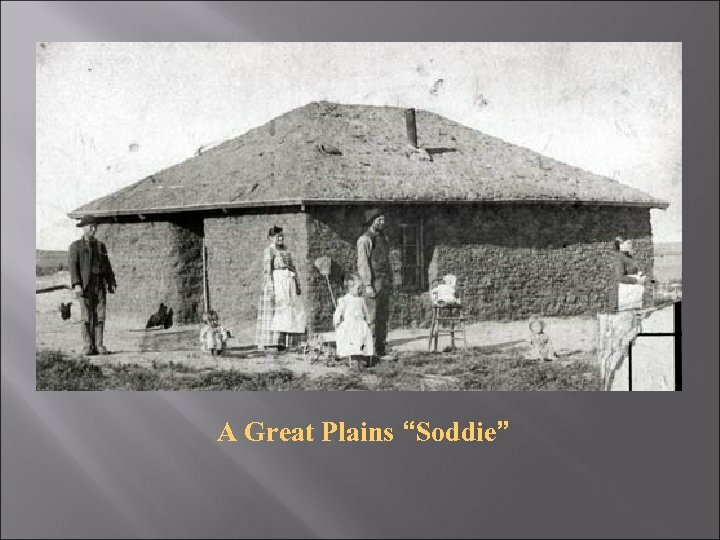 -- Had to build sod houses (“soddies”). 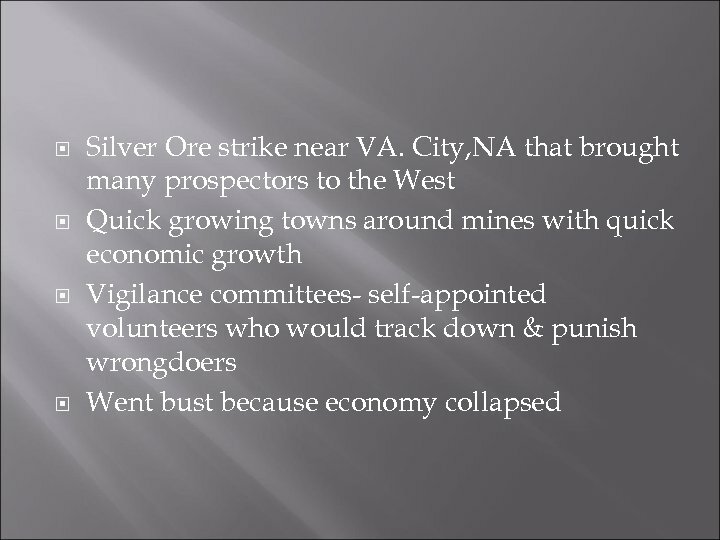 -- Had to drill deep wells. * Heat & drought in summer. 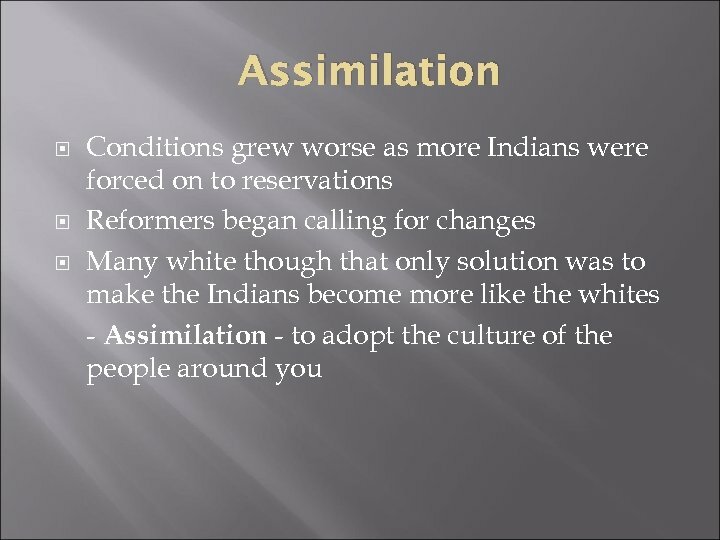 * Blizzards in winter. 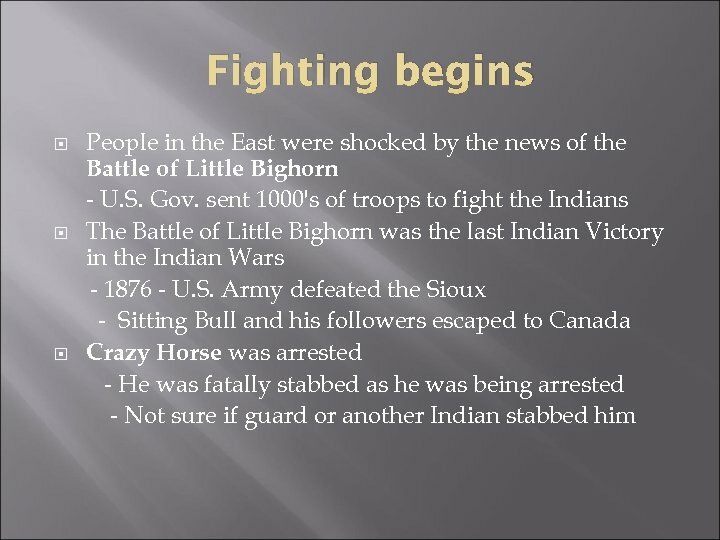 * Prairie fires!!! 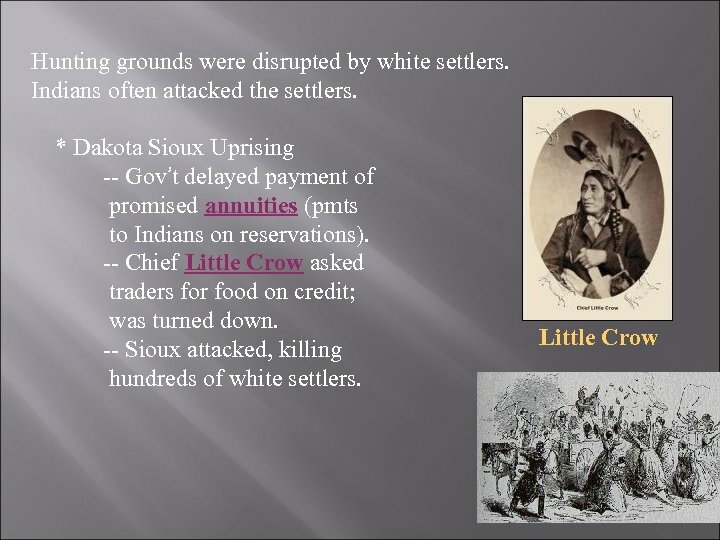 * Swarms of grasshoppers destroyed crops. 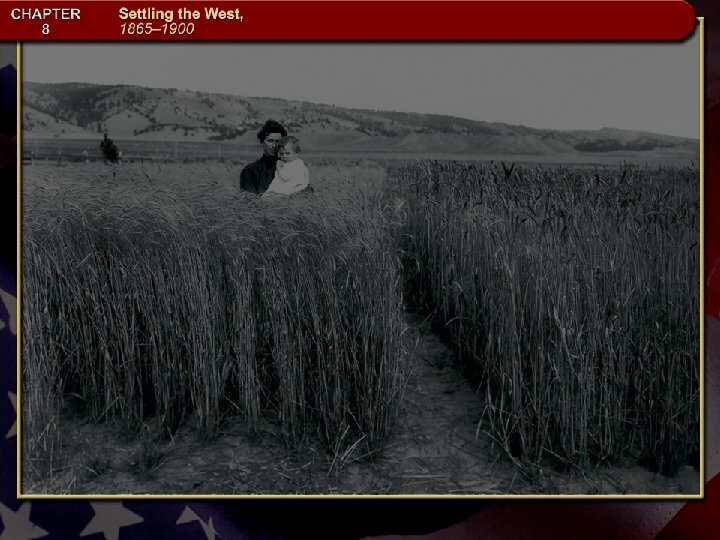 Wheat Belt - eastern edge of Great Plains. * New farming techniques. -- Dry farming - planted seeds deep for moisture. 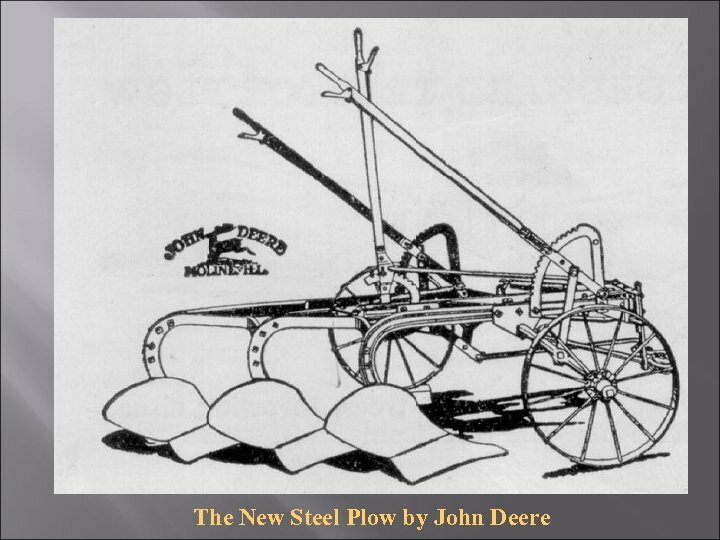 -- Steel plows (John Deere), seed drills, reapers, & threshers. -- Mechanical reapers - faster harvest. 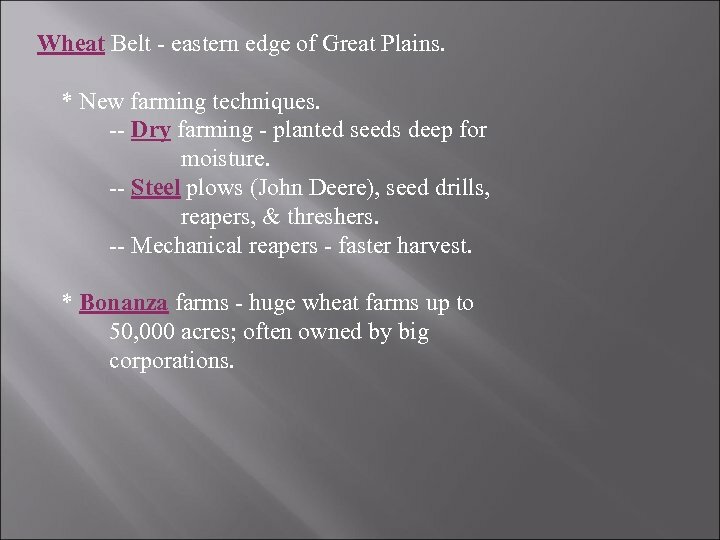 * Bonanza farms - huge wheat farms up to 50, 000 acres; often owned by big corporations. 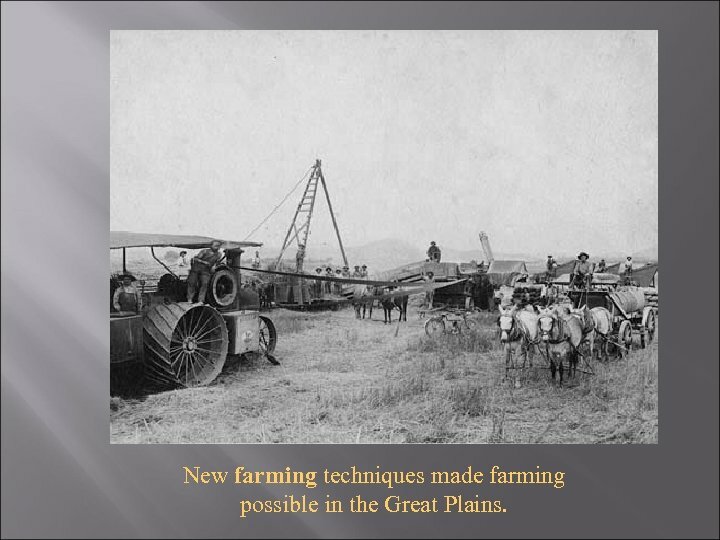 New farming techniques made farming possible in the Great Plains. 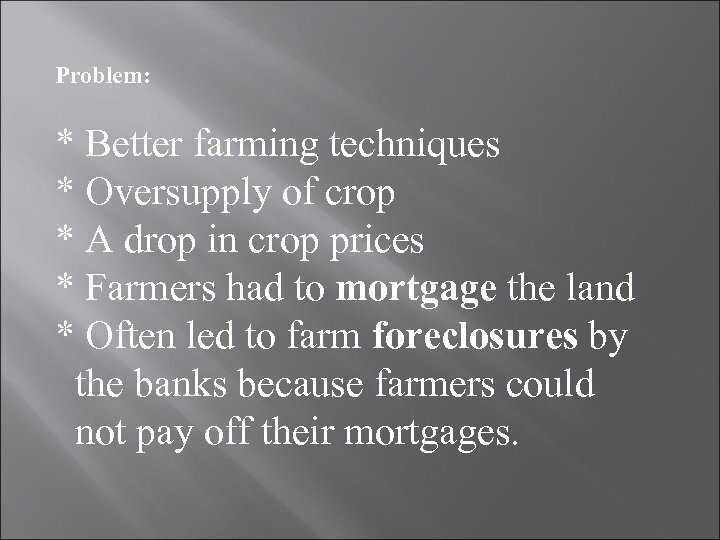 Problem: * Better farming techniques * Oversupply of crop * A drop in crop prices * Farmers had to mortgage the land * Often led to farm foreclosures by the banks because farmers could not pay off their mortgages. 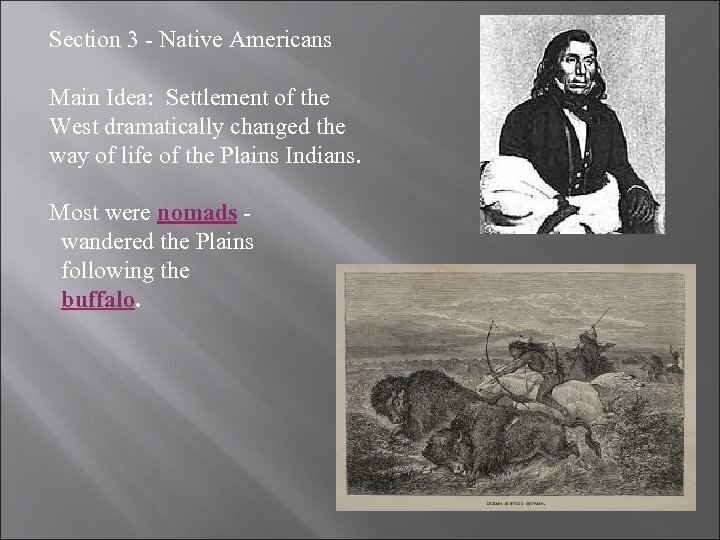 Section 3 - Native Americans Main Idea: Settlement of the West dramatically changed the way of life of the Plains Indians. 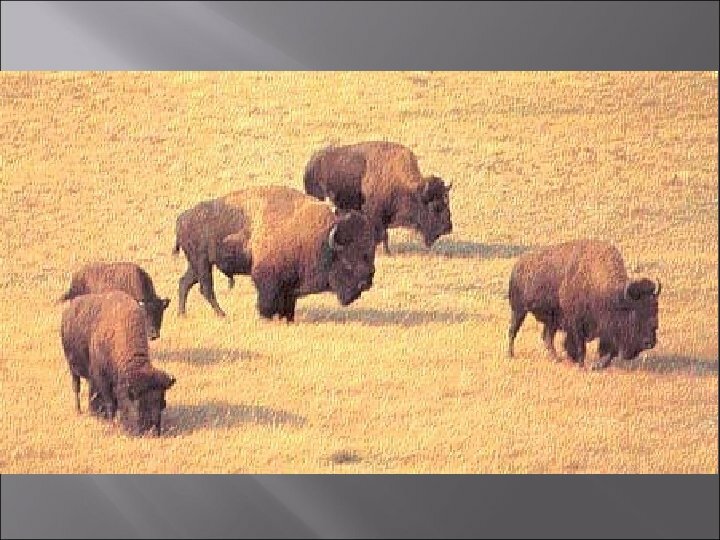 Most were nomads wandered the Plains following the buffalo. 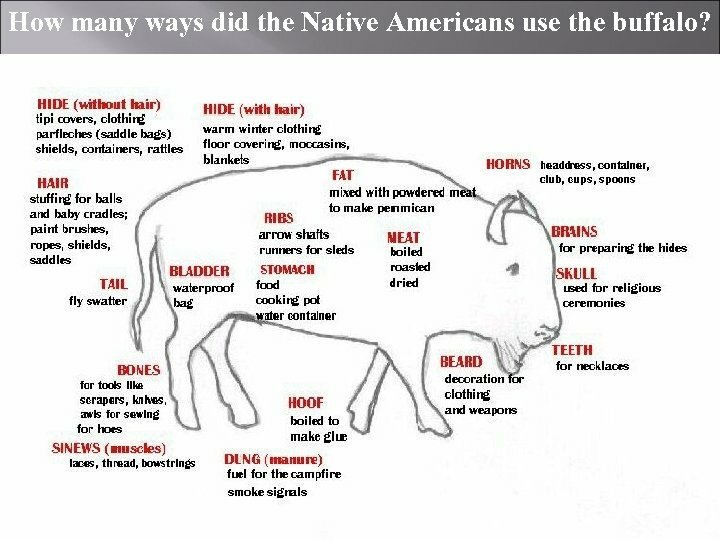 How many ways did the Native Americans use the buffalo? 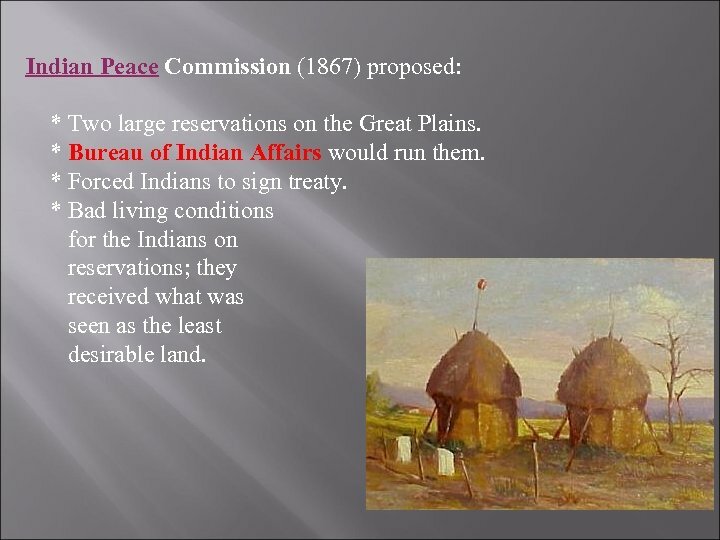 Indian Peace Commission (1867) proposed: * Two large reservations on the Great Plains. 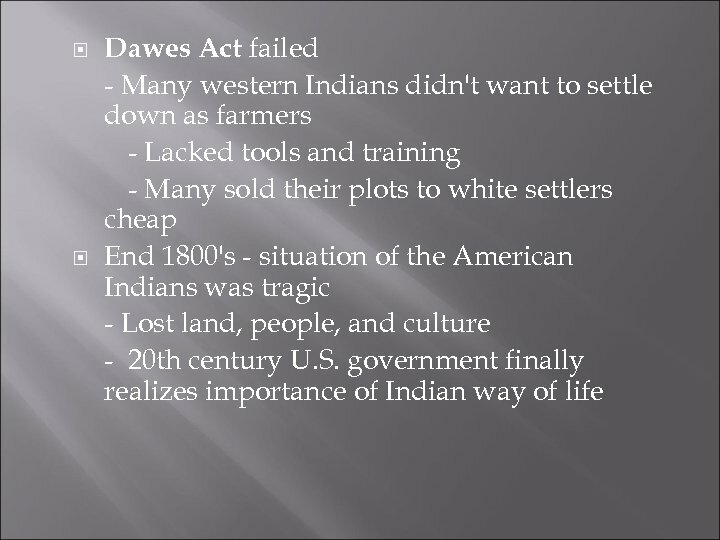 * Bureau of Indian Affairs would run them. 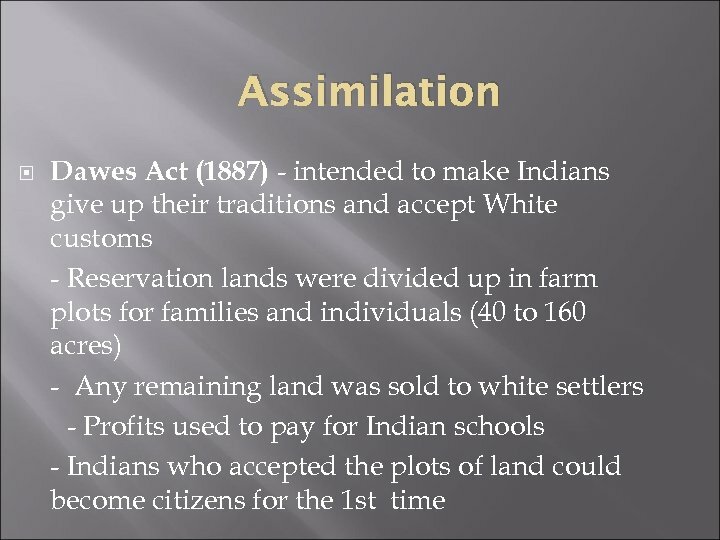 * Forced Indians to sign treaty. 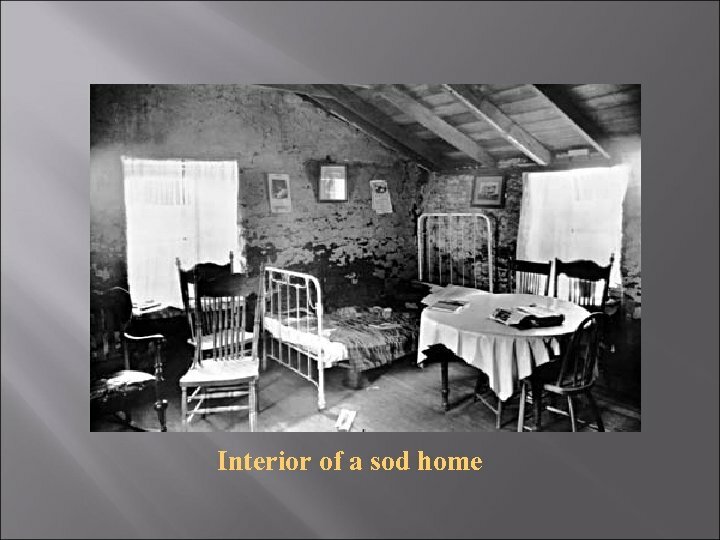 * Bad living conditions for the Indians on reservations; they received what was seen as the least desirable land. 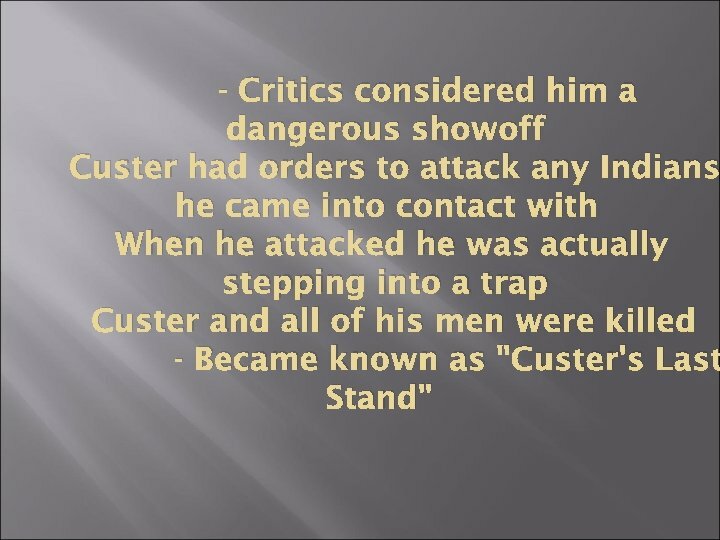 - Critics considered him a dangerous showoff Custer had orders to attack any Indians he came into contact with When he attacked he was actually stepping into a trap Custer and all of his men were killed - Became known as "Custer's Last Stand"
I am tired of fighting. 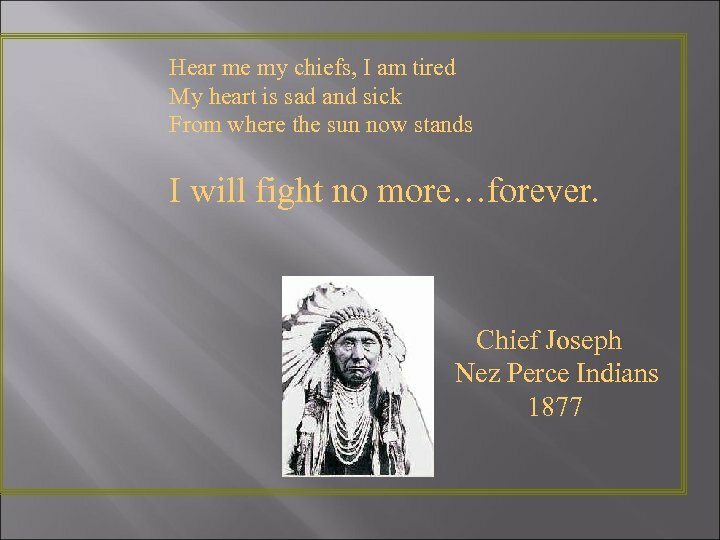 Our chiefs are killed…. The old men are all dead. 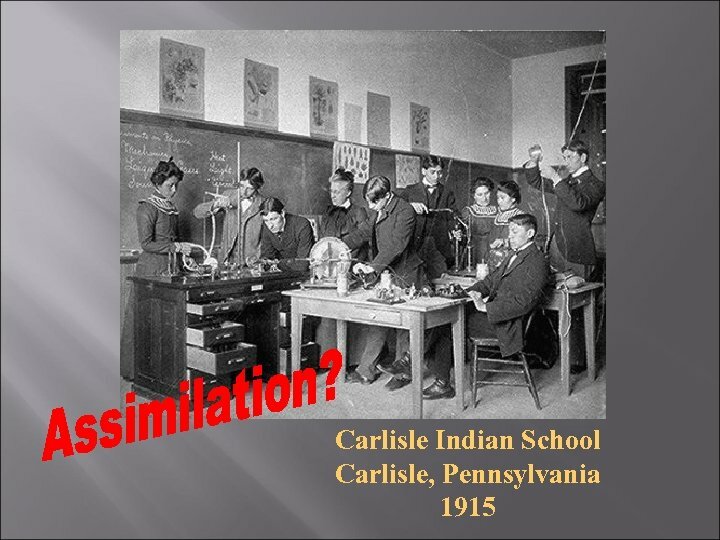 It is the young men who say no and yes. 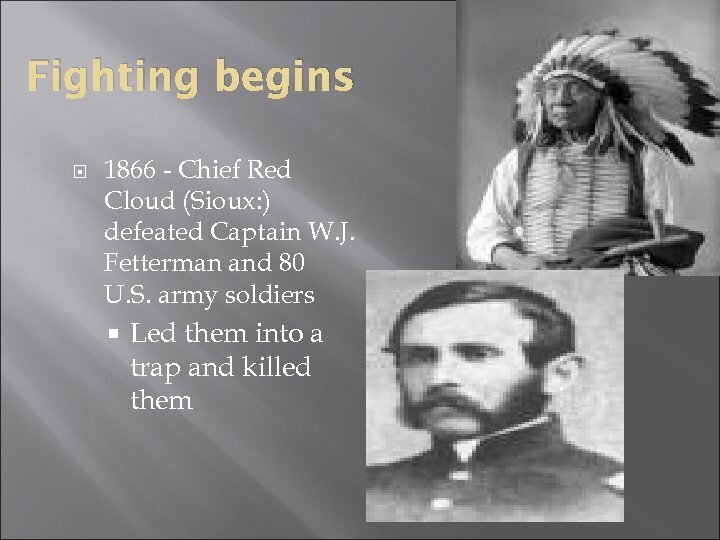 He who led the young men is dead. It is cold and we have no blankets. The little children are freezing to death. 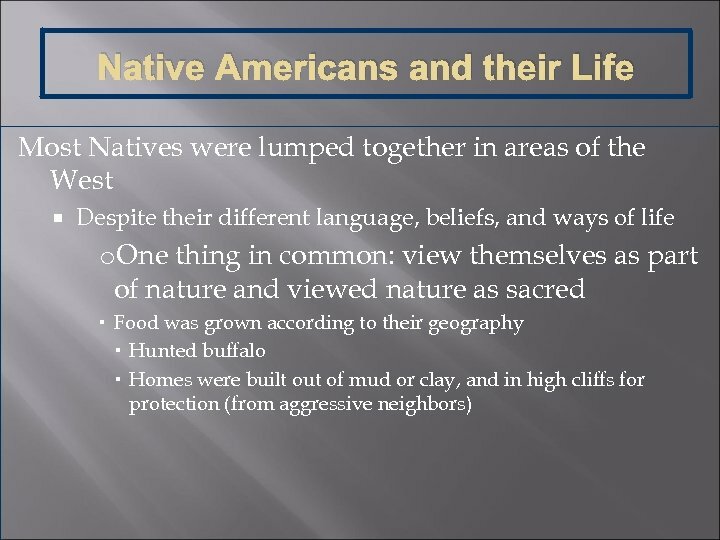 Some of my people have run away to the hills And have no blankets, no food. No one knows where they are Perhaps they are freezing to death. 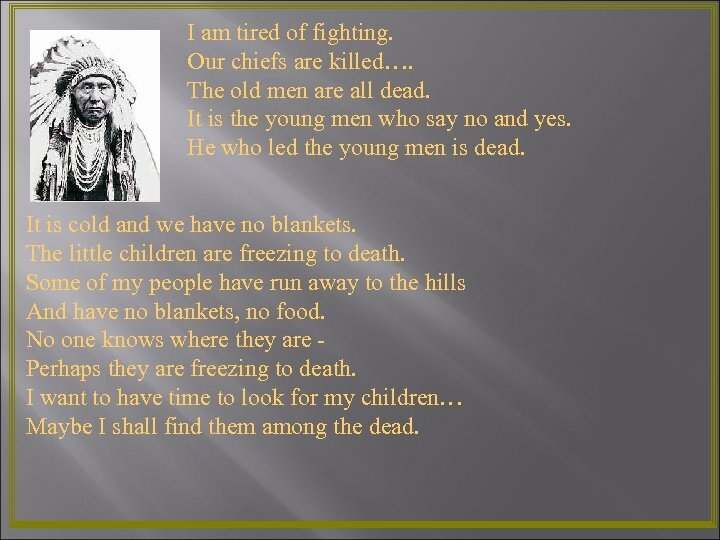 I want to have time to look for my children… Maybe I shall find them among the dead. 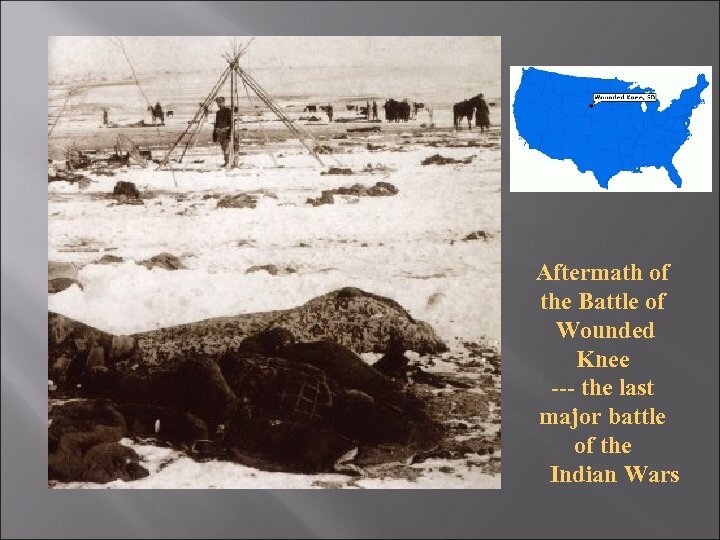 * Wounded Knee - 1890 -- Lakota ignored orders and continued to perform the Ghost Dance (ritual celebrating the day when whites would be gone, buffalo would return, etc…) -- Battle - 25 US soldiers and 200 Lakota men, women, and children killed. 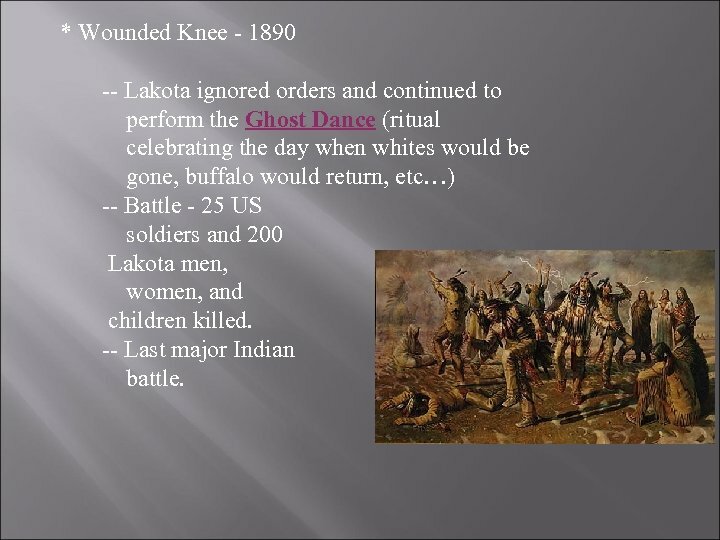 -- Last major Indian battle. 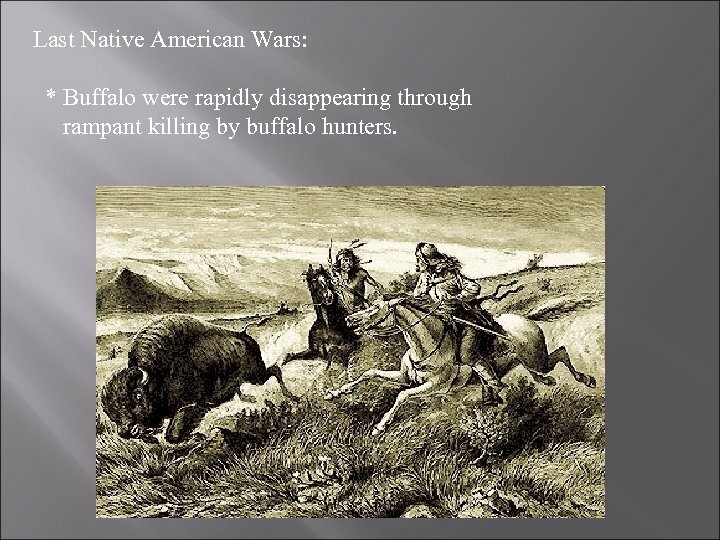 Last Native American Wars: * Buffalo were rapidly disappearing through rampant killing by buffalo hunters.